Fibreglass roofing is a firm favourite amongst flat roofing professionals thanks to its long life span and its finish, which is both glossy and waterproof. When purchasing fibreglass roofing products you can select from top brands like Cromar and a range of our own-brand products to reduce your costs even further. Reliable tools, strong adhesives and sealants, resins, topcoats and fibreglass fabrics are all available for ensure your fibreglass roofing materials can be purchased all in one place. 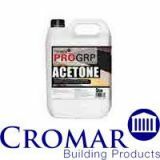 Cromar GRP fibreglass acetone product is unbeatable when it comes to providing a thorough clean. Click through below to order this excellent product at our competitive prices. If you aren’t sure which product is right for your project, give our customer service team a call on 01752 692760 and they’ll gladly talk you through it.